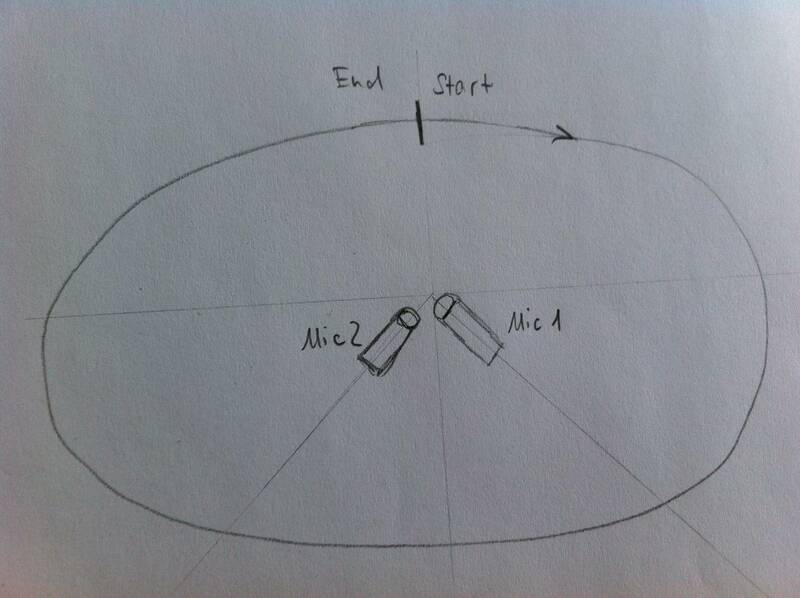 Some explanation since I have got a specific and another more open-ended question: I used two microphones in a 90° arrangement (see picture below) to capture sound from a source moving around the room in a circular /elliptical fashion. The intention is to get an idea about directional hearing. (A second measurement with a KEMAR dummy-head was done as well). to reduce the resolution. 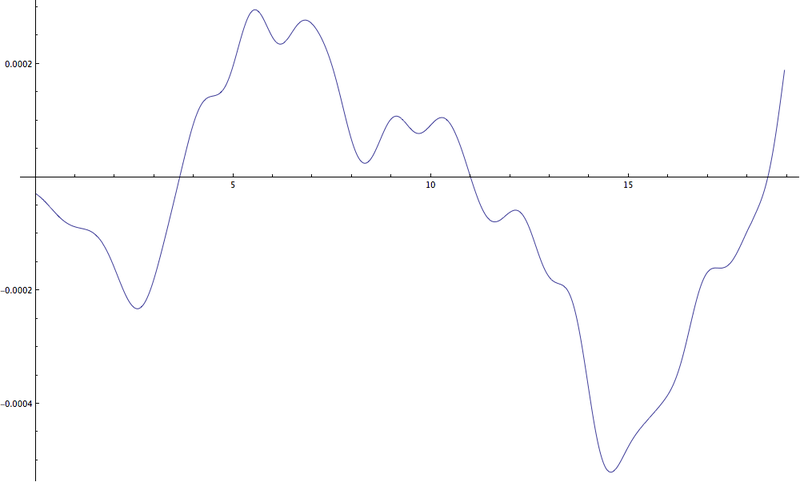 I found by hearing/looking at ListLinePlot that n = 7 is a good catch. That leaves around 7000 entries per channel. with left and right channel clearly divided along the x-axis. 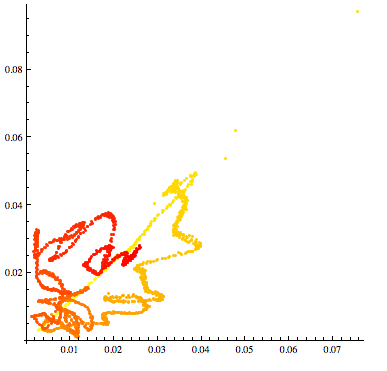 Question 1: Is there a possibility to flip the plot in such a way that x-axis becomes the y-axis? (So that for instance the "loudness" of the right channel is on the right hand side). I tried PairedBarChart actually gives the kind of representation I wish, but It is just not suitable for my data. To visualize directional information between the two signals, it is sufficient to cross-correlate them and look at the time lags. If the signal in, say, microphone A lags that in microphone B, then it implies that the source was closer to B than A. 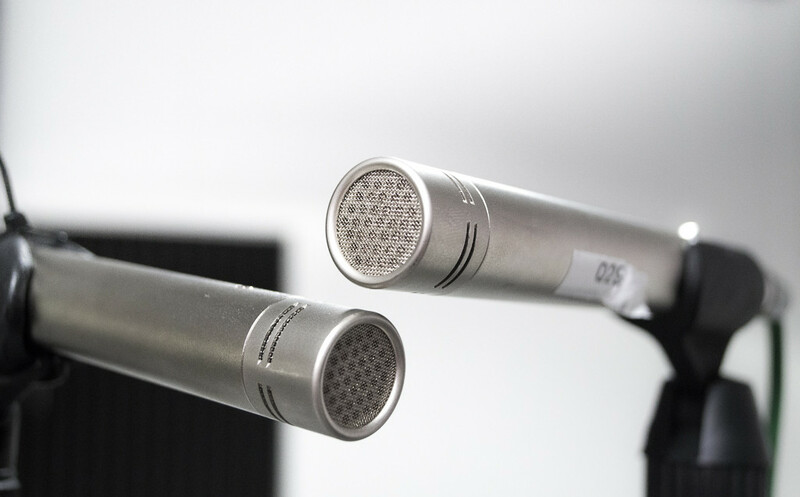 As you move around the room, the lag should change appropriately depending on the sine/cosine (depending on the convention) of the angle subtended between line of the microphones and the source. So moving on to processing, I'll first low pass filter and downsample your data, since most of the frequency content is in the lower frequencies. Note that simply downsampling (as in your nested Drop) without filtering will result in higher frequencies aliasing into the lower ones. Here I've downsampled by a factor of 6, meaning the new sampling frequency is 8000 Hz. Next, I chop the data into chunks of 5 milliseconds with 50% overlap between consecutive chunks and cross-correlate them. You can now clearly see the lag — it is zero at the start and end, when the source is symmetrically positioned between the two phones and increases and decreases as the source moves. 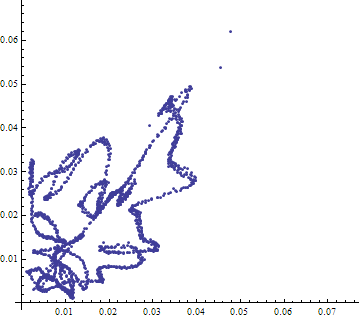 You can now make out the direction from this plot, or perhaps implement a simple delay-and-sum beamforming to get the direction. Note that you can also do the same processing with the original data, change overlap (or none at all), change the windowing, etc., and the basic structure of the lag will remain the same. 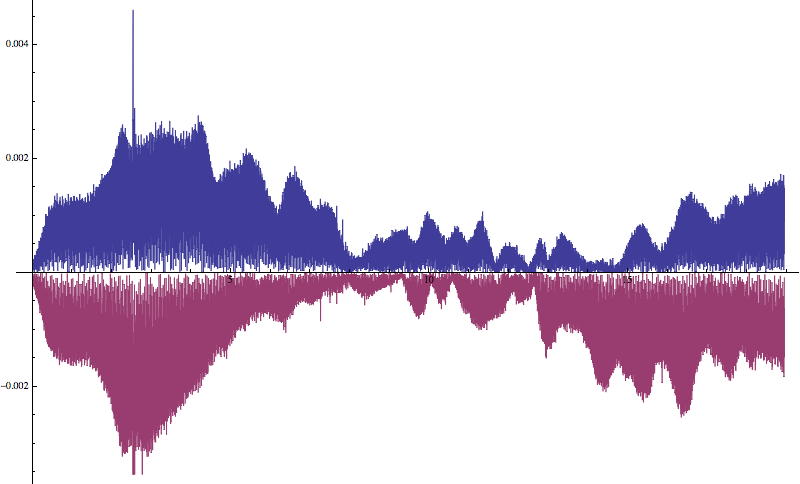 As an interesting exercise, one can also make a guess as to what the spacing between the two microphones might be from looking this lag plot. Since the speed of sound in air is approximately 330 m/s and by eyeballing the plot and approximating the max lag to be at around 1 ms, one can infer that the two microphones must be separated by roughly 30 centimeters (1 ft). 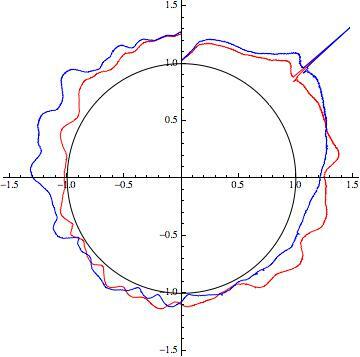 How about plotting it around a circle? This just wraps the amplitude signal on top of a circle which represents the time of your signal. The value 1894 is the number of elements in the sampled signal. They will clearly distinguish when the left hand microphone's response is larger than the right hand microphone's response. Because the source apparently ended where it started, circular or periodic representations of these relationships may be useful. Now we apply visualization principles to design an effective graphic. To enable rapid, accurate comparison of two signals $X$ and $Y$ (which, by virtue of #1, should be logarithms of the amplitudes in the two channels), we should use graphical elements that reflect the differences $X-Y$. We wish to see how they (a) relate to the collective "strength" $(X+Y)/2$ and (b) evolve over to time (as a secondary indicator). A scatterplot of $X-Y$ (log of the signal ratio) against $(X+Y)/2$ (log of the geometric mean) best achieves (a), by (i) representing both coordinates as distances along orthogonal axes and (ii) using a horizontal line as a reference; namely, the line $X-Y=0$: vertical deviations from that line will let us assess the relative strengths of the two microphones. This leaves a host of secondary symbols, such as line thickness, dashing, and color, to represent the temporal evolution. Due to the circular or quasi-periodic nature of this experiment, a periodic color scale seems suitable. 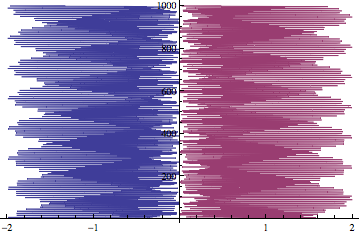 Some subtle alternation in the plot to distinguish positive values of $X-Y$ from negative values will help further. Below, I chose simply to vary the lightness of the background, wishing not to complicate the graphic any further: it already shows a lot (total signal strength, relative strength, and time for thousands of observations). Some statistical insights offer potential improvements. Data can be noisy. To help us see the big patterns, some amount of smoothing is advisable. A convolution with a Gaussian kernel is a quick and easy way to perform a smooth when the signals are not otherwise impaired by extreme outliers. A quick check of the data indicates there are no outliers evident. Here are examples motivated by these design considerations, showing the results for a range of smoothing strengths. The raw signal on the left appears to bear little relationship to the path of the sound source. However, the heavily smoothed signal on the right is promising, showing a strong qualitative relationship to the location of the sound. The middle image preserves some of the major details. To go further, consider replacing Table by Manipulate to explore the effects of the smoothing. How about plotting the signal strength from one microphone on the $x$ axis, and from the other on the $y$ axis. Not the answer you're looking for? 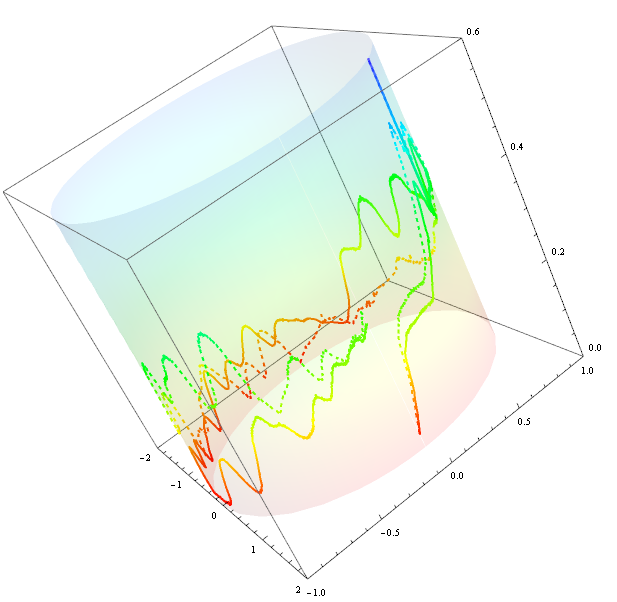 Browse other questions tagged plotting visualization signal-processing or ask your own question. Doing local FFT on huge 3D vector data cell mesh and visualizing it spatially?